-Yes, oh yeah. The internet’s really slow in New York. It’s quite difficult to do, so yeah, better like this. -Erm, I’ll tell you a little bit about what it’s actually going to be for: it’s going to be for two publications. One is le cool, who are about things that are going on in London so that will be mainly focusing on what you’ll be doing at the Whitechapel this week; and also for a publication called New Linear Perspectives, which is a poetry and arts magazine, so, erm, I’m hoping that that can be a little more in depth. -Okay. So you’re coming to London. What can you tell me about your Big Ideas talk that you’ll be doing with Craig Dworkin? -Erm… we’ll be launching an anthology of conceptual writing called Against Expression. Erm, and we’ll be giving introductions to the book and then myself, Craig and Vanessa Place, er, the poet, will be doing readings — selected readings — from the book. -So, yes, so I was wondering about how… in… I saw that she was doing a presentation with you — Vanessa Place — she’s also doing a reading of her own work — is that separate or is it all interconnected? -W’… no, I think the reading that she’s going to be doing on her own is happening somewhere else and Craig’s doing something else on his own as well. But, ah, the three of us will just be reading selections from the book itself but we will not be reading any of our own work, we’ll only be reading the work of others. -No, no she won’t be reading that. -Em, so I, I haven’t seen the anthology yet. Erm, I understand that it’s a collection of work that… it’s a collection of conceptual writing, erm, and from my understanding the works are not only work that has been written since this term ‘conceptual writing’ has been in existence. Erm, er, is that correct that there’s some fairly, kind of, old work included as well? -That’s fascinating. How did you go about finding the work that you’ve included? -Well, you know, we, we just happen to love this stuff; and we’ve been collecting it and we’ve been inspired by it f-forever… and, er, you know, when it came to putting it together, er, the only thing that we really wanted to make sure was that everything in the book was written for the page; so, in other words, you couldn’t have, say, a Lawrence Weiner wall text or a Jenny Holzer wall text, er, even though that might very well have been into the idea of the book, it really had to be work made for the page. -Okay. And, erm, is being involved in this art book fair — is the term ‘art book’ a term that you’re happy with to describe the books that you make? -Well, I mean, most of these, kind of, don’t have much truck in the art world per se, or really in the world of book arts. Erm, they’re kind of, this is kind of an academic publication that is — ah — received by, er, you know — writing programmes, English departments, really. -Made by University Press, really, distributed and kind of received in those more academic, literary circles. -Yeah. How did you, how did you collect those? -Oh I didn’t, I mean I just grabbed them from a website, you know. There’s zillions of websites out there with these — with these words on, with these things on, yeah. -[Laughs.] M-my name is a misheard lyric. -Yeah. My parents were listening to Bob Dylan’s Romance in Durango and they — he sings ‘Me and Magdalena… on the run’ and they thought he said, ‘Me and my Delaina’; so, that’s where my name comes from. -Haha, I will do. I thought of another couple which I don’t know are — if they’re included in your work or not. There’s, erm, err, ‘We’ll share the shelter of mice in the bay’? -Yeah, well, you know, this is actually the whole thing… is, is, err, you know, if you were to do this book you would pick 500 ones that made sense to you. I mean I just picked 500 ones that, songs that I knew. So, in other words, all the books that I do, anyone can do and anybody would… errr… you know, come up with a different book. If you made a book of every word you spoke for a week — err — it would be a very different book than every word I spoke for a week. -So this is, ah, this is the more conceptual side of it — is that these are recipes for literature — you know, very ready-made recipes, that anyone can employ. And that’s what — the great thing about Against Expression is, is that for those — you know — those looking for ways to write there’s about 200 examples of really cool things that you can do. You know, and come up with something completely original that was somebody else’s idea. -Okay. Would you give… equal conceptual weight to somebody that used those recipes and made their own work or somebody that came up with… a completely new template of their own? -Well, you know, sure, I mean people are doing that all the time. I mean, certainly, you know, we don’t own all the templates, nor have we invented all of them… there are many that keep getting invented and many that keep filling the blanks. But the point is that there’s a whole lot of writing now that’s — with, that, with the conceptualisation of the work, sometimes that’s more important than the actual product — of the work — so people are, are, you know, we’re functioning more like programmers than we are writers. We write a good program, pour the words through, it’s gotta be, it’s gotta be successful, it’s gotta be a successful piece of writing. -…when I saw you perform this, on the film, erm, there’s many ‘ə’ (schwa) words which I couldn’t recognise as words. Are they all real words? -Well they’re, yeah, they’re all like, like, all things that I just collected over the course of three years and collecting all of these different sounds — erm — and they were, you know…: air — A.I.R., E.R., R… is like a pause in a word, like ‘er’/’um’, you know, ‘ah’ — the little bits of words that we don’t normally, like, consider to be words, but are very much present in our everyday speech. So, you know, they all come from things from other languages… I didn’t invent anything, I just — everything was found. I don’t — we don’t invent things, we just find them. -It seems that… ‘cause you read a few different sections going up in different numbers of syllables; is there a point of the book at which you move from single words into sentences? -Yeah. It’s quite incredible how it sounds when you, you read it out — erm, I enjoyed that one a lot. -I know you’ve said that you, erm… you know, people tell you that it, it sounds quite mesmerising, but, erm, y-you yourself don’t see it in that way. Is that right? -I mean, I wrote — I published that 15 years ago. So, so, I-I was much more concerned with, er, the way things sound, you know it being, more traditional things, you know, you know, that’s all. It was a much earlier thing. -I’ve moved away from that [laugh], over the years… as the work’s gotten more conceptual. That’s not so conceptual, it’s very lovely, very pleasurable. -Yeah… so those two books that you’re talking about are lovely, fun, pleasurable, but, you know, I’m getting less interested in that as the years go by. -Do you feel that, erm, conceptual writing… I mean, when I look up that term online it’s nearly all your work and Craig’s work that comes up. Do you feel that, erm, it’s something that might be about to take off with more people being associated with that term? -Well, you know, I mean, I think that there’s, you know: because of the way that we’re using language, particularly in a digital medium, people are — the entire world is doing what we’re doing, although people aren’t calling it writing, but then, a lot of people are beginning to call it writing. So the act of moving information from one place to another — reframing, recontextualising information is a legitimate writing strategy now for many people. So, you know, more people are doing this now, yes. -Okay. You read in front of President Obama this year, didn’t you? -Erm. How did you come to choose the Walt Whitman poem that you read? -Er, so that’s how I came up with those — those, er, poems. -How was your excerpt from Traffic received, at that reading? -So — the real poetry they really didn’t care about, but the — ah — but the conceptual poetry — ah — they absolutely loved; so it was a very strange thing where the most avant-garde and the most radical is also the most popular thing that was read that night. -How did the poetry workshop that you did with Michelle Obama go? -Erm… [pause]. It was — er — it was weird, you know, it was more like an interview, more like a talk to a bunch of students. You know, it wasn’t exactly a workshop — ah — you know, but then again, you know — they have — things happen in very odd ways — ah — at a place like that. -In what way do you see conceptual writing developing from here? -Well, I mean, I don’t know. One thing that I do know about it is that this is the first international writing movement since a… a, a, an obscure writing movement that happened in the 40s, 50s and 60s called concrete poetry, which was a way of writing, where it wasn’t contingent upon knowing other languages… So that — I don’t speak Japanese, but I could read a concrete poem in Japanese because the letters were self-explanatory as to what was going on in the poem. For example — ah — they’d give a little key for the word ‘rain’, and it looked like these little letters are-are streaming down the page, and so, you know, that that’s a poem about rain. Similarly conceptual writing is a worldwide movement — going — you know, the book is extremely international and the movement itself is-is international simply because it’s predicated upon the act of not reading. So — you know — I can get a whole book in Swedish and I don’t have to read it, I just have to know what the idea is there and I’ve got it. -[pause] Erm, it’s interesting the — considering the differences between the — where visual art is today and where writing is today, which is something… Sucking on Words delves into a fair bit. Erm, do you think that the — is it true that — do you think that one of the differences is-is partly an economic one in that… erm… there’s just a lot more money involved in visual art and so people will, will buy into that because they want to, er, decorate their homes; whereas writing, erm, in a commercial sense it’s been, erm, we’ve concentrated on narrative for so long because that’s what people want to buy, because people are always going to want to be entertained in that way. -Is that –erm — in any way near where you see it? -Yeah, well, you know, outside commercial fiction, writing has never had any kind of a market, and the beauty of what we do is that it doesn’t — you know — a painter who has a great market has to worry about taking a risk for fear of alienating or disrupting that market — you know — poetry is so un-un… is so impoverished that…ah… that, that it’s-err-obliged to take risks. It must take risks, otherwise what would be the point of playing it safe in poetry? -Okay. Erm, do you enjoy reading novels? -No, I don’t read novels. -How do you spend your free time? -Oh, er, working, you know, all I do is work. -Okay. Erm, so you-y’gonna be in London a very short time, erm, is there anything you’ll manage to do that you’d like to see in London? -Yes, I’d like to buy a kilt. -So I’m gonna — in the east end, so I’m gonna, I’m gonna go get a kilt in my time there. -You can’t, you can’t get ‘em here, they don’t have em here, so I’m gonna go there, and then I have to go to China directly from London and I will take my kilt with me and drop it off at a tailor and have them copy it 10 times. -And is there an item of clothing you’d like to pick up in China? -No, not really. I just want things copied in China. I think they do that very well. So it’s the perfect place to go for-for, err, my, you know — a plagiarist in China is, will be welcomed with open arms. -That’s true. Um, and what writing are you working on at the moment? -Ah, I’m working on a, em, I’m rewriting Walter Benjamin’s Arcades Project for New York in the 20th century. -I won’t, I won’t finish it till I’m 60 years old. -Thank you! Are you going to come to the thing? -Yes. I’m gonna be there on… are you going to be there on the Thursday evening as well? -No, I fly in Thursday. What is, what’s going on on Thursday evening are they having an opening or something? -Okay, great… please come and, you know, say hi, and… thank-you so much for your interest, I really appreciate it. -Okay, well yes, thank-you very much, and yes, looking forward to — very much looking forward to your talk on Friday and I’ll definitely come and say hi. -Great, well see you then, thanks… thanks misspelled Delaina! Delaina Haslam is the blog editor for le cool magazine in London, where a shorter piece appeared recently about Kenneth Goldsmith which you can read here. 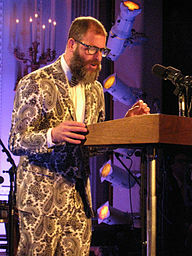 Conceptual poet Kenneth Goldsmith is the founder of UbuWeb. In 2011, he co-edited with Craig Dworkin “Against Expression: An Anthology of Conceptual Writing” and published a book of essays called “Uncreative Writing: Managing Language in a Digital Age”. You can read Vanessa Place’s article for the Poetry Foundation about Goldsmith’s reading at the White House here.